Wandering is a common behavior that occurs in those with a form of dementia. It usually manifests itself in the severe cognitive decline stage, though it can appear earlier in the disease process. Parents will wander “aimlessly” and then become lost in the process. However, what appears aimless to an outsider is, in many cases, a directed movement with a formed intention. They may be looking for someone, trying to fulfill a basic need like getting food, or simply bored. It is not always possible, but finding their underlying need can help you determine why it is occurring in the first place. The advent of GPS has made keeping an eye on loved ones that wander much easier. These digital devices can be worn like a watch and can track your loved one should they leave their home. There are also models that allow you to input specific boundaries. The primary caregiver is notified should the tracking device leave this area. Maintain a regular routine—very important to a person suffering from dementia. Schedule regular exercise periods every day and make it at a time when you notice that your parent becomes restless. This very often occurs at dusk. Place a black mat on the front porch which can appear impassable to someone with dementia. Make sure your parent wears an ID bracelet. If you notice their ID bracelet lying about their home and off their wrist regularly, consider sewing their personal information into their clothes. Hook up the windows and doors to an alarm system that alerts the caregiver when they have been opened. Inform a neighbor or two about the possibility of this occurring so that you have someone close by to contact should you find out they have left their home. Ensure all their needs are met such as hunger, thirst or the need to go to the bathroom. Avoid busy places with large crowds. Even with all your diligence, wandering can and does occur. When it does, begin an immediate search. According to the Alzheimer’s Association, 94 percent of people who wander are found within 1.5 miles of where they disappeared from. 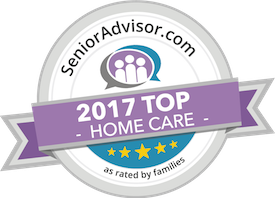 Consider obtaining the services of a senior care provider who has provided care for countless individuals facing this disease. They can be there to protect and support your loved one when you can’t, and provide that all-important companionship that will only grow dearer with each passing year. Have questions about senior care in Lahaina? Contact the caring staff at All Care Hawaii today. Call Oahu (808) 206-8409 or Maui (808) 664-3853. Call us 24 hours a day, 7 days a week!